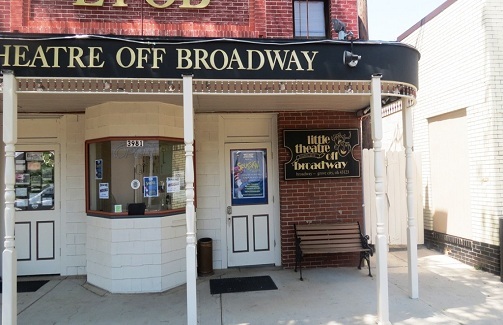 While taking a stroll in downtown Grove City after dinner one summer evening, Mark Huffer stopped in front of the Little Theatre Off Broadway (LTOB) to view the showings at the marquee. Mark shared a spiritual moment that night as he expressed the idea to help with the theatre building renovation. He wasn’t certain how he could help but he just knew he had to do something to support the local town’s theatre. So, the following work day, Mark called the theatre. Thus began an exciting process of getting acquainted with the charming theatre, it’s hard-working board members and fun patrons. Mark Huffer owns a general contracting business that specializes in building renovation, masonry restoration and historical preservation called Utmost Renovations. Huffer strongly believes that businesses should share their financial blessings with others such as charities and non-profits. 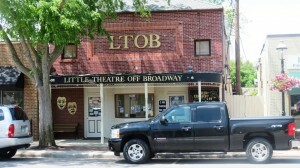 So, this time, he was led to help his local community by restoring the Little Theatre Off Broadway. Huffer met with the board members, Lisa and Jim, to tour the theatre and determine what the old building needed to maintain its structural integrity and upgrade its appearance. Huffer learned that the theatre has a very small operating budget and that his help was truly a God send as Lisa put it. Upon inspection, Huffer found the structure to be solid and safe but there were active leaks in the roof, walls and foundation. Huffer and the board members discussed many issues but fairly quickly agreed to prioritize the needs of the building renovation in order of importance and determine a budget for the repairs. Hence, a plan was developed to first; stop the leaks into the structure, second; make the front of the exterior facade and main entrance sparkle, and third; replace the old stained worn carpet in the main theatre and the tile in the restrooms. Huffer was certain all the priorities above could be completed for a budget of approximately $7,500.00 that Utmost Renovations would donate covering all the expenses for the labor and materials. Upon project start-up, the first thing Utmost’s expert masons and roofers tackled was the leaking roof, walls, and foundation. In order to remedy the leaks, the masons performed some brick replacement where old bricks had spalled or crumbled, tuckpointed using an historical mortar mix of failed mortar joints, caulked window and door perimeters as well as steel lintels, repaired stucco, patched concrete, and pointed and sealed foundation joints along the sides of the building. Utmost also repaired the leak in the roof with new flashings and shingles. Fortunately, these repairs stopped the leaks. Secondly, Huffer had his crew clean the front masonry facade, spot-tuckpoint the worst of the mortar joints, remove some old anchors and patch the holes, and his skilled painters clean, caulk, prime and paint all the decorative wood on the marquee and main entrance. This revitalized the original appearance of the marquee and made the front of the theatre look beautiful once again. Lastly, Huffer’s excellent flooring crew removed the old carpet and pad in the foyer, lobby, and main theatre and replaced it with new 10 year commercial carpet and a thicker 8 lb. pad. The restroom floors also were refinished as well with new tile. This made the inside of the theatre look considerably more up-scale and much newer. The renovation project turned out well for all parties. Once the project was completed, the LTOB and it’s patrons were very pleased and thankful. The community as a whole was very grateful as Huffer received several hand-written thank you notes from strangers that deeply appreciated him doing this renovation on the LTOB that love and appreciate theatre. This was the icing on the cake for Huffer. In fact, Huffer and Utmost Renovations has agreed to help maintain the LTOB for the foreseeable future. If you have an old historic structure such as a home, building, or church in need of restoring or you simply need some routine maintenance, call Utmost Renovations as they will certainly restore your beloved property with the utmost integrity and quality. Mark Huffer, is President of Utmost Consulting and Utmost Renovations. He is a BOMA (Building Owners and Managers Association) Instructor on building envelopes. Mark is a leading authority on Building Restoration and Historic Preservation.